Colonial rotifers get jiggy with it in a video entered in the Olympus BioScapes Digital Imaging Competition. Australian high-school teacher Ralph Grimm assembled the video from microscopic images. You might not think something wonderful can be found in a ball of slime — but Ralph Grimm's prize-winning video of the creatures living in a bit of pond scum proves it's possible. Grimm's microscopic view of a colony of rotifers, complete with googly eyespots, won first prize in this year's Olympus BioScapes Digital Imaging Competition. More than 2,000 pictures of tiny life-science subjects were submitted from all over the world — and today Olympus announced that Grimm led the top-10 list. You can see all 10 prize-winners, plus a selection of the entries receiving honorable mentions, in our slideshow. Grimm, a 45-year-old high-school teacher from the Australian town of Jimboomba, says he found the microscopic colony in a bit of drab-looking leaf debris that he dredged up from a pond on his property. "They look very plain," Grimm told me. "They look like slimeballs. You wouldn't take notice unless you knew what you were looking for." Fortunately, Grimm knew exactly what he was looking for, thanks to his long-running passion for microscopy. He recalled that he got his first microscope as a gift at the age of 7. "Once I learned to use the instrument, I got hooked on it. It's followed me along all my life," he said. When Grimm got the slimeball under his microscope and cranked the magnification to 200x, he couldn't believe his eyes. "I had never seen this species of rotifer before," he said. Rotifers are tiny animals that live primarily in fresh water and gobble up gunk. As I mentioned last year in an item about the critters, there's a good chance that you've swallowed down more than a few rotifers if you drink unfiltered tap water. Some might think they're icky, but Grimm thought they were so cool that he set aside everything else he had planned for the day. "Forget about lunch. Don't worry about breakfast," he said. "This is how I spent the entire day, just filming." After capturing gigabytes' worth of pictures, Grimm figured he had a good entry for the Olympus contest. And he was right. As the first-prize winner, Grimm is receiving $5,000 worth of Olympus camera and microscope equipment, plus an expense-paid trip to San Francisco to bask in his glory. Arlene Wechezak's picture of red algae earned her the $2,500 second prize, and Igor Siwanowicz won the $1,500 third prize. Siwanowicz's ultra-close-up view of a fern wasn't the only picture recognized by the judges: He also scored three honorable mentions for his beautiful portraits of a feathery amphipod appendage, a moth's curled-up proboscis and an oak lace bug. 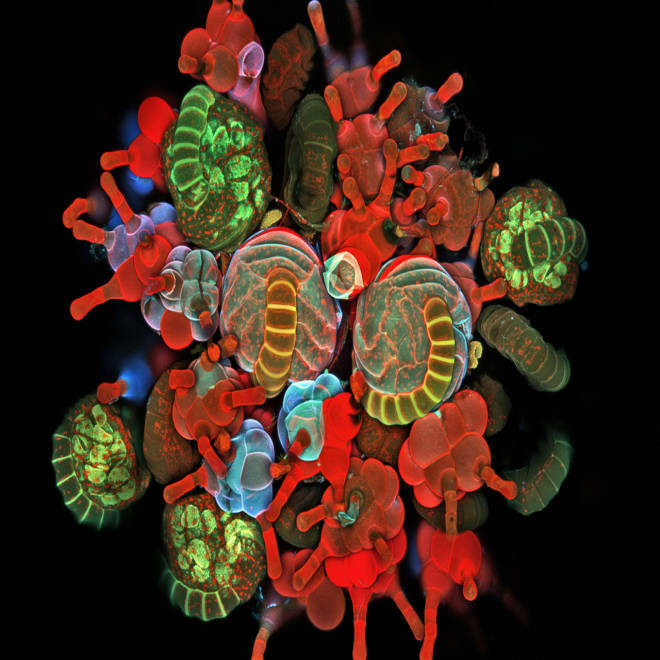 Siwanowicz, a researcher at the Howard Hughes Medical Institute's Janelia Farm research campus in Virginia, uses a laser-scanning confocal microscope and a palette of pigments to bring out the details in his small-scale subjects. "To our eyes, the specimens appear very different from the final image," Siwanowicz told me in an email. "Usually they are colorless, sometimes showing red hue, depending on the intensity of staining. The samples of invertebrate exoskeletons stained with Congo Red dye are very often bright red." He assigns different colors to the different wavelengths given off when his subjects are illuminated. "Assignment of the color in the captured image to any given channel is purely arbitrary; however, I do assign blue to the channel recording light of the shortest wavelength, green and red in similar fashion, in the 'natural' order," he said. "Combining the three channels into one produces the whole palette of colors. That is the closest to real representation of colors achievable with this microscopic technique — in effect, it is like the microscope had trichromatic 'vision,' just as we do." Click through the slideshow to see what Siwanowicz is talking about — and grab your red-blue glasses to see the 3-D effect in this bonus picture of the oak lace bug. If you're in need of some red-blue specs, stay tuned: We'll be running a 3-D glasses giveaway on the Cosmic Log Facebook page later today. This 3-D photomicrograph provides a frontal view of the oak lace bug, a common pest found in oak trees. Wear red-blue glasses to see the 3-D effect.